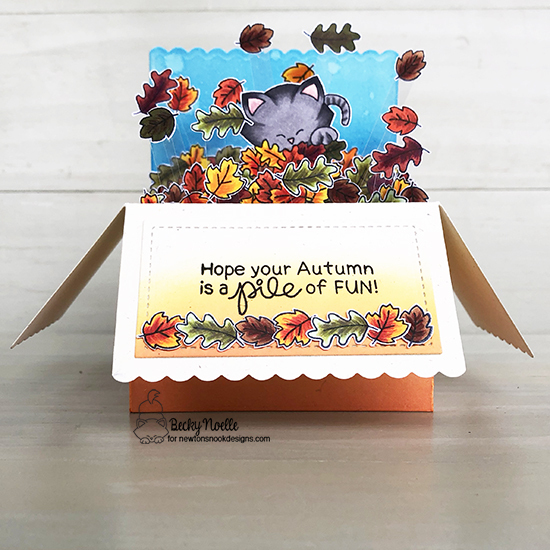 Becky Noelle creates this 3-dimensional pop-up box using the Autumn Newton stamp set. She creates a blue autumn sky then colors her frolicking feline. To create that big pile of leaves, she stamps a lot of leaves, fussy cuts them, and does a lot of masking. A labor of love that is totally worth it because this is just a-meow-zing! 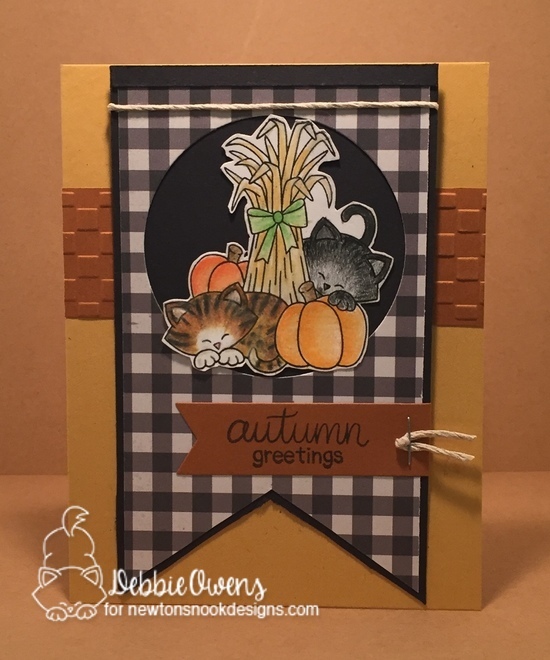 Debbie Owens creates multiple layers by embossing a brown stripe. She then adds a large banner in black gingham with a black border. 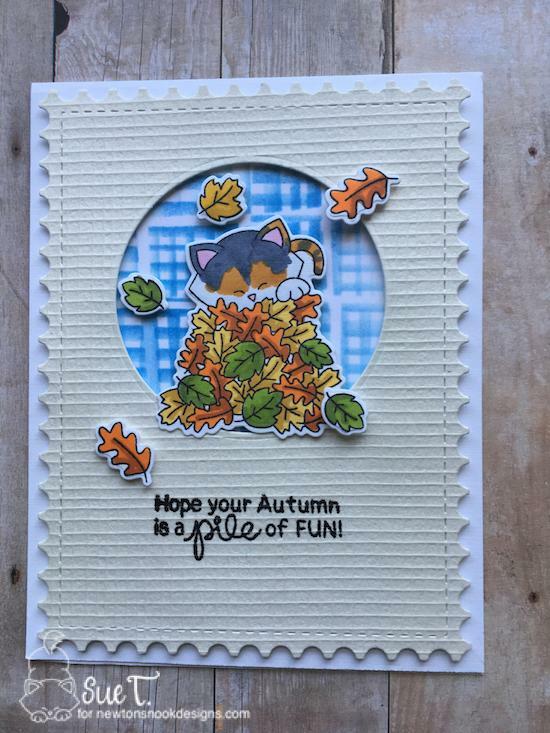 She then die cuts a circle for a black frame to showcase Autumn Newton stamp set image. She adds the sentiment to a smaller banner and adds some twine to finish it off. 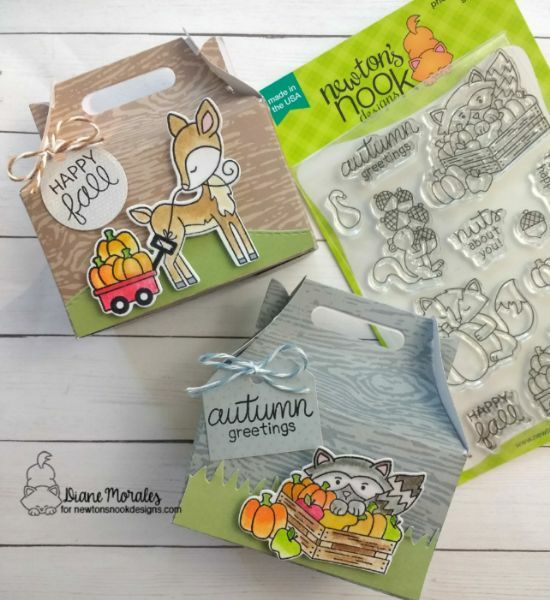 Diane Morales creates these little autumn treat boxes. Can't you just see these sitting on your Thanksgiving table? After creating her boxes, she creates the grass using the Land Borders Die. She then colors these sweet critters from the Harvest Tails stamp set and adheres to her grass. Using the Tags Two Times Die, she creates tags and adds a bit of twine to finish them off! So cute! 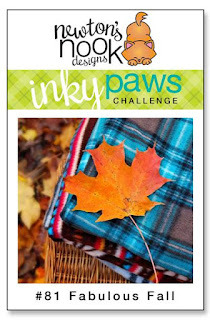 Sue T. mimics the plaid blanket in the inspiration photo by using the Serene Stripes stencil. She then stamps this fun-loving feline from the Autumn Newton stamp set who is frolicking in the leaves. Using the Framework die set, she creates her background and stamps the sentiment. I hope these projects have inspired you to play along! Remember, you have until this Friday, September 28, 2018 to enter. There's a prize involved too, so don't delay - view all the entries and see more inspiration on our Inky Paws Challenge here!